The digital cat's out of the bag. It's no secret that software is opening up new markets and tearing down old barriers to entry. Innovative startups are flooding in to capitalise on these opportunities. For many established businesses, though, unless they find new ways to compete quickly, they run the real risk of going out of business, and soon. By 2020, up to 40% of incumbents face the prospect of being displaced by digital disruption. Understanding the challenge, and responding effectively, though, are very different matters. For large organisations, adding in new capabilities typically involves large, costly, and risky projects, which are difficult to deliver on time or budget. Digital partnerships:- formal collaboration with specialist digital partners to gain exposure to new technologies and capabilities. Investing in development:- adoption of new software development practices, such as Micro-services. Buying in capabilities:- 3rd party, cloud-based solutions that can be easily integrated to improve and simplify operations are essential for maintaining competitiveness. Let's take a closer look at these pathways to innovation. 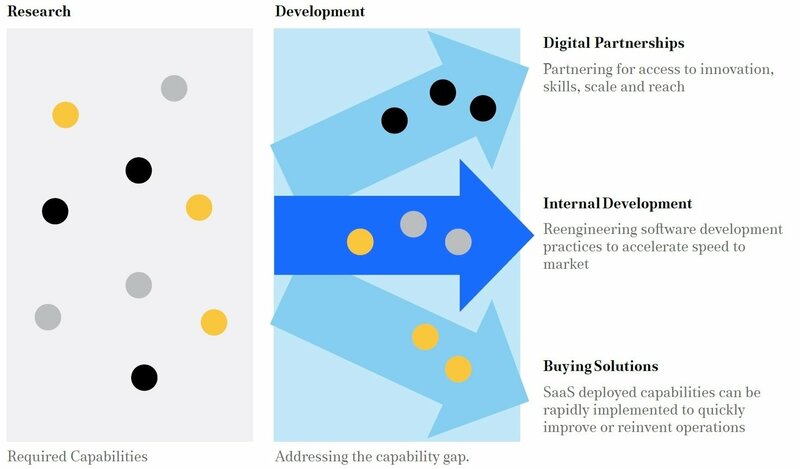 A new partnership paradigm is emerging, which gives established firms access to digital capabilities, while offering leaner, tech natives market reach and scale. These partnerships range from traditional alliances between two or three parties, to distributed networks of dozens or more businesses, government bodies and other related organisations. An example of the latter is the Amsterdam Smart City - a public-private partnership formed in 2009 by the municipal government, the Amsterdam Economic Board, a telecommunications operator (KPN) and a power-grid operator (Liander). Revenue, of course, is a prime driver, with over 60% expecting their partnerships to generate at least one-tenth of their income within the next 12 months. The 3-tier model, or Monolith, has been the standard for enterprise software development for decades. Applications are split into independent, functional code bases consisting of the front-end (presentation tier), the back-end (logic tier) and data storage (data tier). The challenge is that this architecture becomes inflexible when applications grow larger, and new features are added, with complex systems running into potentially millions of lines of code. Adding in new capabilities is a slow process that needs large scale development, testing and implemention, corresponding with an increased risk of project failure. This has led to the growth of new software methodologies, like Micro-services, which offer increased agility, and allow new features and products to get to market faster. 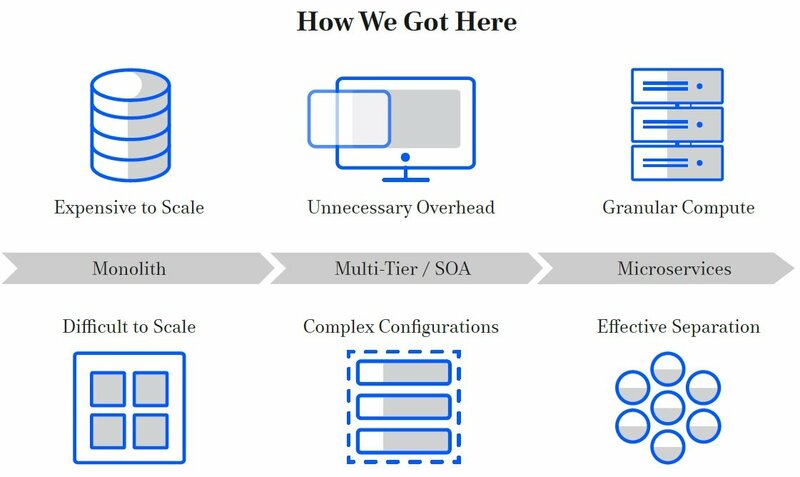 Instead of having large applications deployed as a cohesive unit, the aim of microservices is to pull these apart and create separately deployable units which can be pushed into production independently, allowing organisations of all sizes to innovate while still mitigating risk. Open development and software-as-a-service (SaaS) solutions are critical to giving organisations the ability to rapidly streamline operational capabilities. Spending on cloud computing infrastructure and platforms will grow at a 30% CAGR from 2013 through 2018 compared with 5% growth for overall enterprise IT. Subscription pricing model - from CAPEX to OPEX: SaaS subscription models are usually monthly operational charges, which require no initial capital investment and are immediately tax deductible, removing up-front cost based barriers to adoption. Rapid deployment: SaaS applications require no additional hardware, and little or no IT support is required for implementation. This allows rapid installation, demonstrations, prototyping and access. Vendor responsibility for upgrades, uptime and security: Typically delivering higher levels of security and performance than what can be achieved in-house. Higher adoption rates: Delivery through familiar web browsers means SaaS apps tend to have lower learning curves and higher adoption rates. Work anywhere: Since the software is hosted in the cloud and accessible over the internet, users can access it wherever they are connected, facilitating multi-site, remote or home-based work. Integration and scalability: Some customization is usually available to meet business requirements. SaaS vendors create APIs to allow connections not only to internal applications like ERPs or CRMs but also to other SaaS providers. In the next edition of our operational innovation series, we'll take a deep-dive look at digital partnerships, the critical success factors, and the full range of benefits that large and small organisations are generating from them. To read these insights now, check out our Operational Communications Handbook. It's your complete guide to the growing role of best-in-breed communications technologies in fundamentally transforming business models and operational processes, to stay competitive in the Digital Age. Since the introduction of iOS and Android in 2008, mobile apps have grown to become the primary inte..
Communication Nation: When Crisis Hits, Technology is your G..
2016 was the hottest year on record, globally, and the World Meteorological Organisation forecasts t.. Here at Whispir, we’re in a privileged position to work across a wide range of industries and profes..
As a healthcare provider, you’re no doubt looking for the best ways to implement innovative processe..